We introduced our new Recipes to Go range to you last autumn, with a trio of mouth-watering chef-worthy dishes for you to recreate in your own kitchen! Making mealtimes easy, we’re giving you step-by-step original recipes created by Didsbury’s Food Sorcery chef. Handpicked by our team of local producers, all the fresh ingredients you’ll need are included with the recipes to whip up these specially crafted meals at home. Creamline’s Moroccan Spiced Soup – a real winter warmer. With hand-selected fresh vegetables from Manchester’s Smithfield Market, this recipe will get you on your way to 5-a-day in no time! For an extra special twist, try adding crumbled feta. 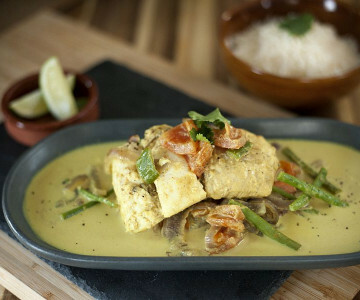 Keralan Coconut Fish Curry – exclusively sourced, beautifully fresh hake fillets from Creamline’s local fishmonger form the base of this dish. This creamy Indian curry has a delicious heat and is best served with rice or Bombay potatoes. Mexican Pork Tenderloin – Little Pigs butchers have locally sourced the premium pork tenderloin for the star of this recipe. The step-by-step instructions make this dish a doddle – in the unlikely event that there are leftovers, try tossing the meat into cooked noodles with some soy or sweet chilli sauce. Available for delivery to your doorstep from Tuesday to Saturday, give our Recipes to Go range a try! Be sure to share the results with us on Twitter, Instagram and Facebook.